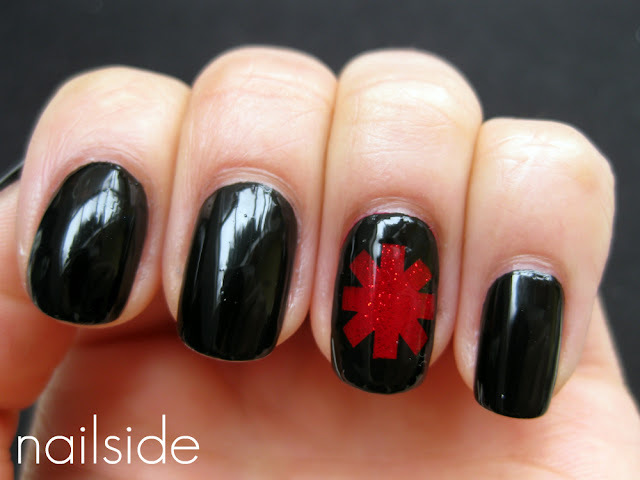 Hello everyone, for this mani a tribute to one of my favorite bands: Red Hot Chili Peppers, because they're awesome. It's a simple mani with just their symbol as accent nail. The cross symbol was easy to make with the use of tape. As my base color I used the gorgeous, #1 China Glaze must-have (in my opinion); Ruby Pumps. This red polish with micro-glitters deserves a price really, it's girly and classy but at the same time vampy and sensational. My pictures don't do justice to it at all. Cross shape before I shortened the arms; this way it still looks too Union Jack , lol. @Sara ♥'s ...: I do too :) To be honest, I was very hesitant about shortening the arms, afraid I would mess up the 'Union Jack', lol. wow, really nice job. so neat and perfect! Red Hot Chili Peppers are awesome, I love them! Great mani!! 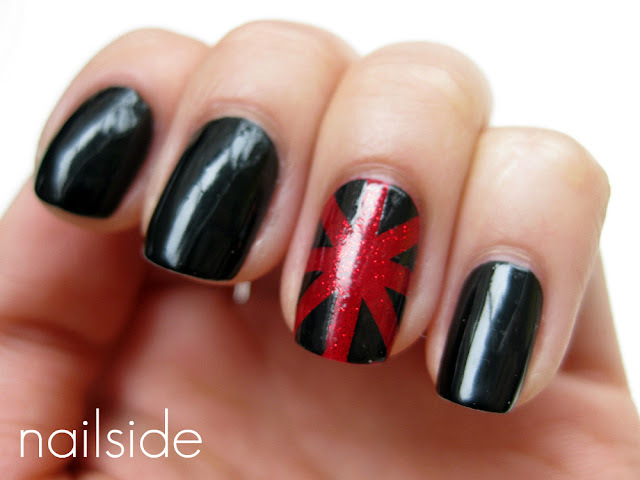 Very cool, as usual I am totally crazy about your mani :) I just love the combination of red and black. I did a taping recently too, I can't believe how easy it is to get something cool with a bit of tape! Looks great, love the red polish you used. love it!! you are so talented!!! Thank you all! I love reading your messages!